Thomas Ovans congratulates Ver Poets on their 50th birthday and on the anthology they have produced to celebrate it. St Albans based Ver Poets are to be congratulated on reaching their 50th anniversary. Their website at http://verpoets.org.uk/ gives details of their current and recent activities – but it is remarkable to think that when the group started out there was no web, no email, no on-line publishing. 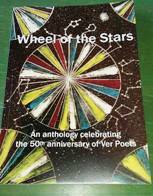 In the beginning there was the pen, the typewriter … and the Cyclostyle duplicator, as John Mole, President of Ver Poets, points out in his introduction to Wheel of the Stars which is the handsome anthology that the Society has produced to commemorate its half-centenary. Wheel of the Stars has been edited by Anna Avebury, Gillian Knibbs and Greg Smith and runs to a generous 95 pages of poems augmented by a handful of illustrations. The contributors are, for the most part, current and former members of the society; but there are also quite a few offerings by poets from beyond the St Albans area who have connections with the society – for instance by reason of having been a guest performer at one of the regular readings. A few of the poems are specifically targeted at the occasion. Merryn Williams (in defiance of the otherwise alphabetical ordering of contributors) opens the volume with ‘A Birthday Card for Ver Poets’ which remembers two millennia of inhabitants who scribbled verse beside the Ver. In ‘Stranger than Fiction’ John Gohorry offers a narrative piece which describes a very odd incident that happened when he was on his way to read at Ver Poets. Some of the poems which I found most striking were those that wander away from the everyday world and venture into more imaginative spaces. Anne-Marie Fyfe directs us to ‘The Museum of Might-have-been’ where Standing in line is no guarantee / of admission; Nick Drake surprises us by giving voice to someone who becomes addicted to ‘Ollamaloni’ – an Aztec ball-game; Janice McConnell offers a highly enigmatic ode to smile design entitled ‘Beyond the Village of Potemkin’. On quieter note, Carol DeVaughan takes us into an airport chapel (where I suspect few of us have ever been though we have often seen the sign) where prayers speak in tongues and a voice from the outside world keeps reminding us to keep your baggage with you. There are fewer examples than I might have expected to find in an anthology such as this of the sub-genre ‘poems about writing poems’. One is the closing piece by Ver Poets founder May Ivimy with its vivid beginning The poem touched me and it sprang / into the curve as the rainbow does. Another, which takes a less high-flown view of the business of being a poet, is by Rik Wilkinson who deals ruefully with the fraught business of sending out magazine submissions and is forced to admit that I counted them all out – / and I counted them all back. It is of course difficult to do much more than give a flavour of a varied anthology like this one: there are many other thoughtful and carefully crafted poems and poets that I might have mentioned. If you can get hold of your own copy then you will have little trouble in compiling a lengthy list of your own favourites.